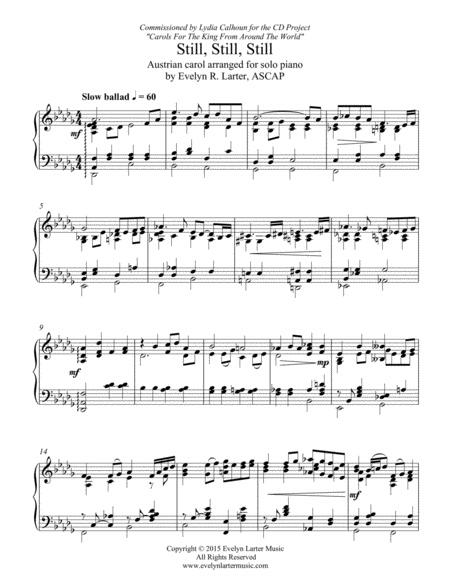 Composed by Evelyn R. Larter, ASCAP. Christian, Smooth Jazz, Christmas, Recital. Score. 4 pages. Published by Evelyn Larter Music (S0.273457). This is the lovely Austrian carol in the style of a jazz ballad. Originally part of a CD project commissioned by clarinetist Lydia Calhoun, I have taken the piano accompaniment and rearranged it as a piano solo at the request of a pianist who contacted me after purchasing the version for cello and piano (also available from Sheet Music Press). She was unable to find a cellist but wanted to be able to play it anyway! For advanced performers, it would be great in Christmas concerts and church services in the month of December. The original clarinet solo is contained in my publication "Carols For The King From Around The World", Volume 2. More information on my music may be found on my my website, www.evelynlartermusic.com, and on my Facebook page for Evelyn Larter Music. Feedback always welcome! 2017 Holiday Contest Entry. This version of Still Still Still is beautiful. I originally found it for piano and cello but the composer was kind enough to make a piano solo version. I am excited to play this for the holiday season.